SMS appointment reminders are a highly effective method to improve appointment attendance and cut no-show rates, both of which increase revenue and productivity in the many industries that depend on appointments. Customers who fail to arrive for an appointment lose money for your business. Further loss occurs when staff waste valuable time chasing no-show customers to reschedule appointments. One of the many benefits of SMS is its ability to cut through a busy person’s day and demand their immediate attention. An SMS is usually opened within seconds of receipt and acted upon faster than emails or other forms of communication. As a rule, 24 hours before the appointment is the best time to remind customers. 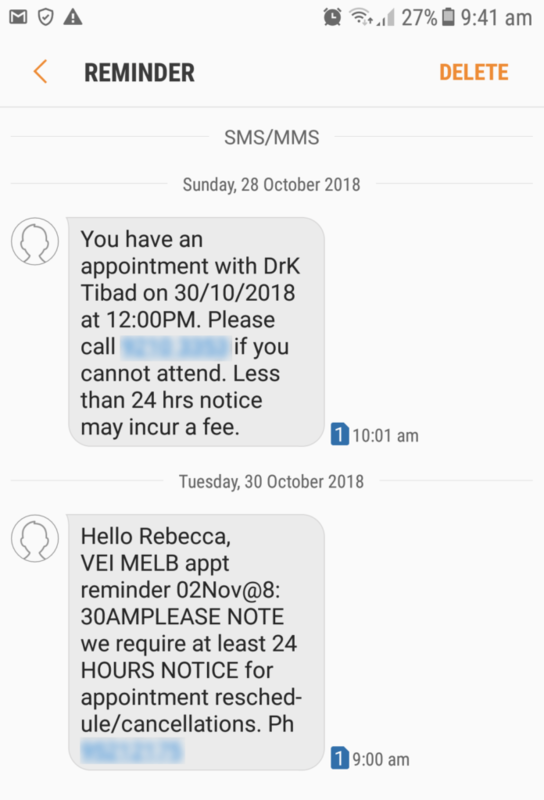 This is close enough to the appointment to prevent customers from forgetting, yet gives you time to fill the appointment slot if they cancel. You might also want to send an additional reminder a few days before as well, but experimenting with different time frames will reveal what works best for your customers and your business. Your message must be clear and concise, without the distraction of unnecessary information. Choose the right tone for your message. You want to sound professional but approachable. Make sure that the customer feels comfortable enough to cancel if they can’t make their appointment. After all, a cancellation in advance is much better than a no-show. Personalising the message always creates a good impression and a friendly tone. Open with the customer’s name can be implemented easily, and even bulk SMS messages can address each customer by name using mail merge facilities. Make sure you ask your customer to respond. Even if the customer just responds by texting ‘Y’ for ‘yes’, this firms up the appointment in their mind and they are more likely to attend. Provide an avenue for the customer to change the appointment. Don’t let the opportunity escape by simply asking the customer to text ‘N’ for ‘no’. Include a contact number or alternative means of rescheduling their appointment. Two-way messaging makes it easy for customers to confirm, reschedule, or cancel their appointments. If you use appointment reminders frequently, a dedicated number is a great way to link your business with the one trusted number your customer learns to recognize. Without a dedicated number your alternative is a shared number. Multiple businesses have access to shared numbers and they are allocated at random and change with every send. Using a shared number from the available pool of numbers is cheaper, but it also runs the risk that your customer receives your reminders from a different number each time – and from multiple businesses! This is potentially confusing and risks the customer missing the appointment. Legal requirements may vary across regions, but most jurisdictions prohibit contacting customers via mobile without their permission. Make sure you have obtained permission from the customer and that this permission is kept on record and up-to-date. The policy for marketing type reminders, such as reminders for vaccinations etc. SMS appointment reminders are hugely successful in reducing no-shows and last minute cancellations. By following best practice, your business can keep the diary full and maximise revenue and productivity.